Updated at 9:01 p.m. on Monday, August 13, 2018, with more information. The Chattanooga City Council will decide Tuesday night whether to declare three city-owned buildings near City Hall surplus property. In a memorandum sent to city council members last Thursday, Mayor Andy Berke's Deputy Chief of Staff Kerry Hayes argued that declaring 1001 Lindsay St., 274 East 10th St. and 100 East 10th St. surplus could bolster the downtown Innovation District he said has attracted more than $1 billion in investment to Chattanooga. Accountability for Taxpayer Money member Franklin McCallie, standing,criticizes developer Hiren Desai's proposal to buy a city-owned parking lot for less than the city paid for it in a 2017 meeting of the Chattanooga Downtown Redevelopment Corporation. Transferring ownership of those properties will require the Berke administration to secure 16,000 square feet of office space to house displaced city employees. There are several viable options for space, but no decisions have been made, Hayes wrote. The city's most recent budget includes $150,000 to fund those lease payments. Helen Burns Sharp, standing, raises questions about the Chattanooga Downtown Redevelopment Corporation's sale of the city-owned property under Walnut Commons to the apartment building's owners at a CDRC meeting in 2017. * Bring several buildings in the Innovation District to more productive and impactful uses, which would continue a "positive economic trajectory of this important downtown area." * Return several properties to the tax rolls and at a higher value than if they were to be sold as-is. * Continue to "build on the entrepreneurial and start-up momentum of the Innovation District" for producing jobs, supporting retail, attracting residents and adding activity to the area. Hayes also noted in the memorandum — which was sent after both citizens and council members asked at last Tuesday's council meeting for more information and background before voting to declare the properties surplus — that the buildings could be used for affordable housing. "Transforming several properties near City Hall is essential to maintaining affordability within the district and will be catalytic to accomplishing other key strategies laid out in the Innovation District framework plan — including ensuring that the district maintains a healthy diversity of uses, demographics and price points," wrote Hayes. If the properties are declared surplus, Hayes wrote, the city will put out a request for proposal, or RFP, in which "the city's highest and best use for each building will be described, along with any other goals for the building consistent with the values of the Innovation District Framework Plan." A minimum bid will be set based on building appraisals. And the Enterprise Center will play a large role in transitioning the buildings if they are declared surplus, he wrote. The Enterprise Center is funding and performing studies on the current condition of all the buildings "to facilitate good decision making." On Monday the Chattanooga Downtown Redevelopment Corporation voted to table two agenda items related to the surplus property. One would have allowed the corporation, a mayor-appointed board, to accept the properties "subject to the properties being declared surplus by the city council." The other resolution would have given authority to the Enterprise Center to "solicit development proposals" for the three properties. A handful of citizens attended the meeting, and two asked the board not to take action until the city council votes. "You shouldn't do it. You should wait for the council," said Franklin McCallie, a Southside resident. "That is premature, and presents the appearance of a conflict of interest." 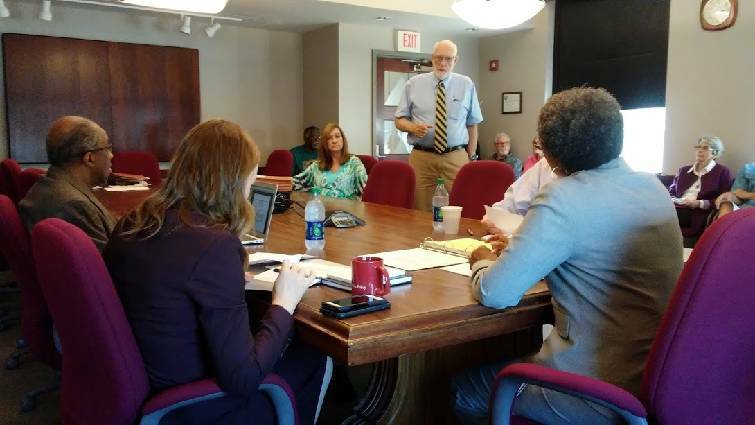 The Enterprise Center works closely with the owners of the buildings who might be interested in buying the city properties or leasing the city office space, including the owners of the Edney Building where the center is located, McCallie said, after the meeting. "When it comes to requiring developers to treat Chattanooga's taxpayers fairly, I no longer have faith in the Berke administration," he said. Helen Burns Sharp, founder of Accountability for Taxpayer Money, who also asked the redevelopment corporation to delay its decision, said she is concerned about the plan because it seems rushed, and,aside from the memorandum sent last Thursday, the council had been given very few details about the idea. The public knows nothing, she said. The City Council and the public have not been provided with a fiscal impact analysis, an evaluation criteria for how a developer will be selected or information on whether informal negotiations with building owners have already taken place, she said. "Public-private partnerships may be appropriate at times, but they require a strong negotiator for the public at the table," said Sharp. "Unfortunately, that has not always been the case on past property transactions such as the King Street parking lot and on tax incentives agreements for PILOTs and TIFs." The board did not discuss the agenda items, but Daisy Madison, city finance officer and president of the redevelopment corporation, said it had been asked to remove it from the agenda. "I would recommend that," she said.